I’ve been thinking a lot about Chuck Berry since his passing. 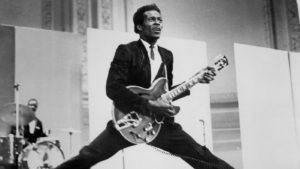 It just so happens that I was finishing up a 3 part Chuck Berry feature on my “Juke In The Back” radio show the week he died, so Chuck has been on my mind a lot lately. 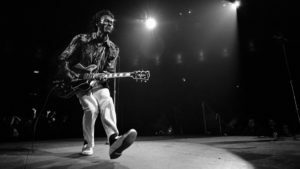 When you look at the career of Chuck Berry, there is a constant that runs through it. Chuck rocked from start to finish. He almost single-handedly invented Rock n’ Roll by taking Rhythm & Blues and Country Music, melding it together and aiming it the youth. “Maybellene,” his breakthrough 1955 single (#1 R&B and #5 Pop) was just an updated telling of the ol’ “Hot Rod Race,” but aimed at teens with their minds on hot-rodding cars. Following that up with more rockin’ car songs (“You Can’t Catch Me,” “No Money Down,” “County Line”), tunes about young schoolgirls (“Sweet Little Sixteen,” “Little Queenie,”), School (“School Days,” “Almost Grown,”) and just plain ROCKIN’ (“Rock and Roll Music,” “Roll Over Beethoven,” “Around & Around”), Chuck Berry defined what it was to be a hip teenager in the 1950s. But here’s the thing, Chuck didn’t change his style in the early ’60s, when many R&B and Rock songs were coming out backed by strings and pop choirs. He didn’t get out of the service and release a bunch of movies with lame pop soundtracks. He didn’t change his style when the British Invasion hit. In fact, in 1965 while The Beatles, Stones, Gerry & The Pacemakers, The Animals, The Kinks and The Zombies were ruling the US Charts, Chuck was screaming, “I Want To Be Your Driver,” one of his greatest rockers. He recorded that one in London, coincidentally. It didn’t hurt that all the British cats cited Chuck as one of their main influences. He did serve time in jail during ’62 and ’63 for an alleged violation of the Mann Act, so he was far from being a saint, but the cat consistently rocked. By the mid-60s, he wasn’t as important as before, musically, but his influence was still felt by every kid who picked up a guitar in a garage anywhere around the world with the sheer intention to rock. Chuck was not the easiest man to get along with or work with, which is so beautifully shown in the film, “Hail! Hail! Rock n’ Roll” (1987), but the guy paid his dues, singing the blues and with that, you’ve got to let a little bit slide. My point is that even though he often imitated himself and his own riffs, he maintained his power and virtuosity for at least 20 years. Older Chuck continued to play each week in St. Louis and travel around, picking up local groups to back him up, because EVERYONE knows how to play a Chuck Berry song, so why travel with an expensive entourage? So get out there and pull up Chuck Berry’s work on Spotify or dig deep into your own record collection and dust off “After School Session,” “One Dozen Berrys,” “Chuck Berry In London” or “The Great Twenty-Eight” and just dig on it for a while and know that the cat you’re listening to consistently ROCKED and ROLLED his entire life. He died 90 years young, because well, Rock n’ Roll will do that to you, you just gotta believe. And with that, “Roll Over Beethoven, dig these Rhythm & Blues.” Indeed. Somewhere out there, a Gibson is being plugged in and a mighty riff is being laid down by the true master. We love you Chuck and we wouldn’t be where we are today with out you. We lost the legendary Riley B. King on the evening of May 14, 2015 at the age of 89. B.B. died at his home in Las Vegas. Riley B. King was born in Indianola, MS on September 16, 1925. 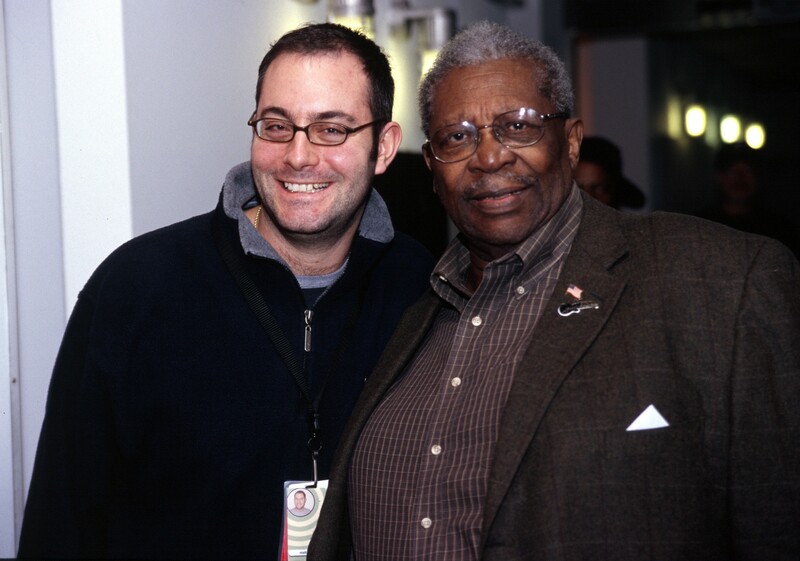 He permanently moved to Memphis in 1948 and was soon broadcasting on all-black radio station WDIA. By the early ’50s, he was cutting sides with Sam Phillips at the Memphis Recording Service (before Phillips started Sun Records) and The Bihari Brothers’ RPM Records was issuing them. He scored his first #1 in 1951 with Lowell Fulson’s “Three O’Clock Blues,” and the rest is history. Dig on my 55 audio obit below highlighting B.B.’s great musical achievements from 1951 to the present. He was one in a million and our last connection to the “true” blues. He leaves an incredible body of work and a huge void in American Music.